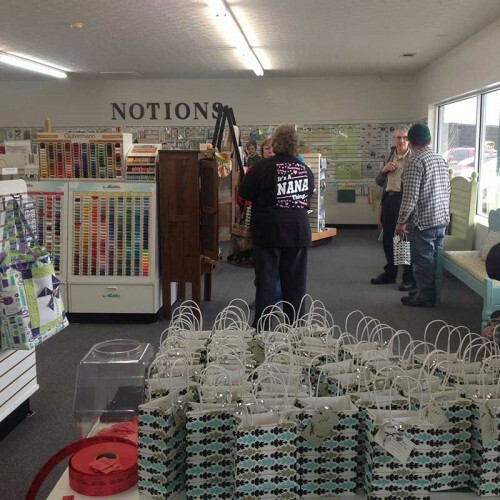 As we blast through the first month of 2015, I’d like to share a few tidbits from our January Grand Opening at Fabrics Galore and Quilting Store. Our Grand Opening was a success. The weather was perfect. 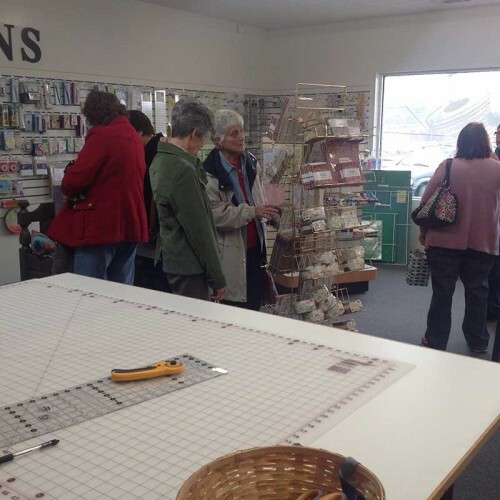 We had a lot of fun and enjoyed a wonderful attendance from the Quilting Communities of the North Georgia area. A big THANKS goes out to all of our fans and customers for your support and kudos. We’re thrilled to have successfully traversed this big event! Many of those who attended our Grand Opening celebration enjoyed our refreshments and especially the homemade cookies. We received many requests for the recipe which we’ve posted below! If you would like to print this recipe, scroll to the bottom of this post where you’ll see our social media share buttons. Click on the Green button on the left and then click the Print Friendly button. You’ll be able to scroll over images and click on the “delete” to get rid of the images before you print. Deleting images will only delete the printable format, not the web page. Or, you can copy and paste into your own text editor. In a large bowl, cream the butter and add the Confectioner’s sugar. Gradually add flour mixture to creamed butter and sugar, and mix well. Next, stir in pecans. Refrigerate until chilled. Roll into 1-in. balls and place on ungreased baking sheets. Bake at 350 for 10-12 minutes or until set. Cool completely on wire racks. Roll cooled cookies again in confectioners’ sugar. Caution: don’t handle cookies while hot, as they will crumble. Wait until just warm to coat with confectioners’ sugar. As a reminder, we’ll be adding several new classes to our calendar so watch for the updates and if you’re subscribed, you’ll receive notice of the new classes that we add and a sign up form – since there is limited seating for each class. Join us for our Grand Opening Celebration This Week! 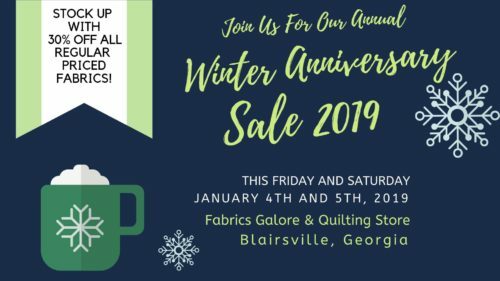 On Thursday, January 15th, 2015, Blairsville, Georgia’s NEWEST Quilting Store is inviting you to celebrate our Grand Opening! Fabrics Galore and Quilting Store is located at 19 Cobalt Street in Blairsville, Georgia. There’ll be lots of fun, gift bags, door prizes, friendly conversation and refreshments to enjoy! 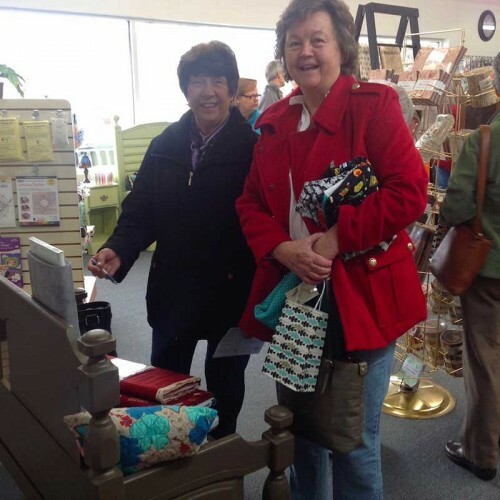 The first 100 customers will receive a Goody Gift Bag full of Quilting Trinkets. We’ll also conduct Door Prize Drawings at Noon, 2pm and 4pm! Refreshments will be served. While on our website, we invite you to Subscribe to our e-News to receive a coupon for 10% off on the purchase of one cut fabric. 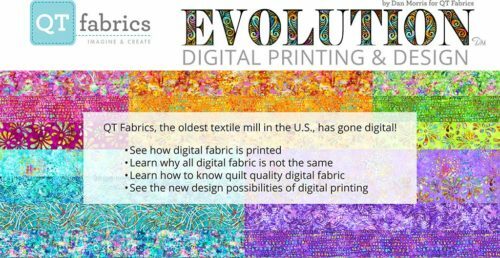 You’ll automatically receive our monthly blog posts about classes and workshops offered, new fabrics we receive, coupons and specials being offered in store, and other highlights you’ll want to be the first to know. You can unsubscribe at any time through the link at the bottom of each email. Course we don’t want you to unsubscribe, and its our job to make sure you enjoy the communications you’re receiving and find our quilting website a nice tool and reference for friends in the region who might want to make plans to visit our beautiful new store. Yo may have seen our ad below in the local papers. Mark your calendar to stop in for our Grand Opening Celebration this Thursday, January 15th. We’ll see you there! as an All in One Shop. We offer beautiful fabrics, for traditional and modern quilting, by top quality manufactures like Moda, Robert Kaufman, Michael Miller, Timeless Treasures, Maywood, RJR and Kona just to name a few. As owner & operator, I am committed to offering my customers a welcoming gathering place filled with creative options and helpful staff. We are committed to finding the products that fulfill your needs. If we don’t have a product we will endeavor to find it for you. Fabrics Galore and Quilting Store will feature seasonal fabrics all year long to help you get ahead of the excitement before each holiday and special event in the North Georgia region. We’ll offer seasonal specials and sales offerings throughout the year, with values to excite your shopping experience and help you with gift and craft ideas. Both ‘designer’ as well as ‘value’ fabrics will be available during our in-store sales. Be sure to check our Calendar for upcoming events and Subscribe to our eNews so we can keep you updated on highlights, coupons and upcoming classes and workshops.